The Golden Gate, powered by Santa Fe #8L, an EMD E1 diesel locomotive, poses for a publicity photo in 1938. "Drumhead" logo signs such as these often adorned the ends of observation cars on the Golden Gate. The Golden Gate was one of the named passenger trains of the Atchison, Topeka and Santa Fe Railway (AT&SF). 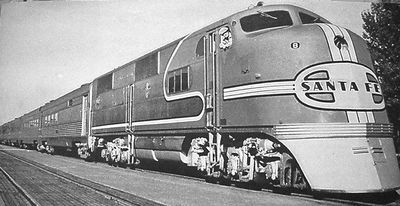 The lightweight streamliner was assigned train Nos. 60–63, and ran daily between Richmond and Los Angeles via California's San Joaquin Valley. Connections with Santa Fe Trailways bus lines extended the line across the Bay Bridge to San Francisco and as far south as Los Angeles. A direct competitor to the Southern Pacific Railroad's San Joaquin Daylight, the Golden Gate's scheduled 9-hour and 25-minute transit time bested that of the Daylight (and busing partner Pacific Greyhound) by some 20–30 minutes. After a series of public hearings and legal challenges were concluded, the first all-new, six-car consists entered revenue service on July 1, 1938. Standard fares were $6.00 for one-way travel, $10.80 round-trip, rates that were matched by the SP. The entire route comprised 312.8 rail miles and 112 bus miles. The train was all but eliminated on April 11, 1965 though No. 62 was reassigned as No. 8 and took over the duties of the southbound Fast Mail Express. Service was ended once-and-for-all on April 28, 1968. October 8, 1935: The Santa Fe applies for permission from the California Railroad Commission to operate "one-ticket, point-to-point, streamlined train service" between San Francisco and Bakersfield, with coordinated motor coach (bus) service extending the route south to Los Angeles. November 12, 1936: The San Francisco-Oakland Bay bridge officially opens. July 1, 1938: Revenue operations for the coordinated rail-bus service commence. 1940: The Golden Gate consists are expanded to seven cars with the addition of two "chair" cars. 1942: Consist size expands to 7 cars, and each logs 626 daily miles. July, 1949: Valley-type 6-6-4 sleeping cars are added to train Nos. 60 and 61. 1957: Train Nos. 62 and 63 add railway post office cars to their consists. 1958: The use of round-end observation cars is discontinued. February 2, 1958: Train No. 61 is quietly withdrawn from service. June 15, 1958: Northbound rail service is cut back to Richmond. April 11, 1965: Train Nos. 60 and 63 are withdrawn from service, and No. 62 is redesignated as No. 8 (the southbound Fast Mail Express). April 28, 1968: The Golden Gate makes its last run. 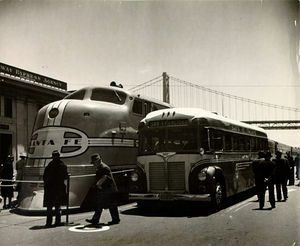 A Santa Fe Trailways bus sits alongside a Golden Gate consist on display at Embarcadero and Mission Street in San Francisco in June, 1938 to promote the 9-hour coordinated service to be provided between the Bay Area and Los Angeles. *Extra car added between Chicago and Oakland during the summer months. In May, 1960 two-unit ALCO PA sets replaced the F-units. Car #1346 was converted to a "Vend-O-Lounge" vending machine car in May of 1964 (operated by the Harvey Company), though it failed to gain public acceptance and was subsequently replaced with a standard 1500-series Lunch Counter Diner the following September.